1. Why should you purchase a bipod for your AR-15? No doubt, shooting bags are great; but that's only when you are not hauling them about. If you plan to go hunting or any sports that requires shooting from different spots, then you probably need something more convenient. In this case, a bipod is perfect. Purchasing a bipod for your AR-15 will help you to achieve more accuracy and stability when shooting in such situations. Even though many AR-15 bipods usually leave users with more weight on their arms, the ones we have reviewed above actually causes less fatigue to you. 2. What should I look out for when purchasing an AR-15 bipod? 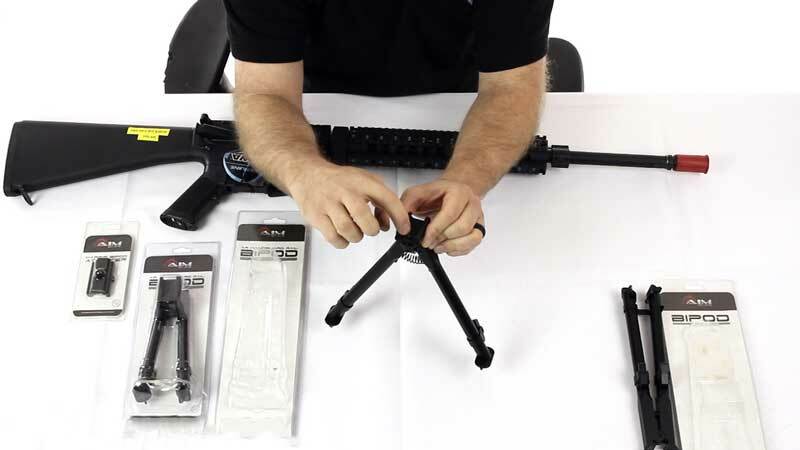 There are many things to take into consideration when choosing the best bipod for your AR-15. But the most important ones are - durability, height, method of attachment, feet, and of course, your purpose. You should get a bipod that goes with your calibre and application. For instance, you need something very sturdy and robust if you plan on shooting a "heavyweight" target rifle like .50 or more. However, for something like a .22 Cal, you will need a less robust bipod. Either case, you want to get a bipod that will provide you with a stable shooting platform. It should also be able to withstand a lot of stress resulting from continuous use abuse. Obviously, you want to get a bipod that has an adjustable height. 3. Do these bipods feature a swivel? By now you would have noticed that not all bipods can swivel. But whether or not an AR-15 bipod possess this feature is less important; it all depends how you plan to use the bipod. If you plan on using your AR-15 for tactical shooting, hunting or any other active sports shooting, you will definitely need a bipod that can swivel. However, for the range, you don't really need a bipod with this feature. We do recommend getting an AR-15 bipod that has a wider swivel radius as this can enhance your shooting and overall experience. 4. Can I use these bipods for the AR-15 airsoft replica? Definitely! Even an experienced user might not be able to notice any difference between the real Airsoft and its replica. This is mainly because both weapons use almost the same set of accessories. In other words, the bipods used for real AR-15 will also fit the replica. Thus if you own an Airsoft AR-15 replica, you can still purchase any one of the bipods reviewed above. 5. I want to hook a sling to my bipod - is it possible? One of major reasons why bipods are generally preferred over shooting bags is that they are more convenient. You can fit them in your backpack as you stroll along. Some AR-15 bipods can even fit in your cargo pockets; however, you will just have to leave the pocket loose. Luckily, most AR-15 models - like the ones we've reviewed above - will allow you connect a sling. 6. Do I need any extra component to mount my AR-15? Well this depends on the type of bipod you purchase. With a good AR-15 bipod, chances are that you won't need an adapter or any extra part to stand the bipod. This is why we do not recommend a universal bipod. Luckily, with our list of the best AR-15 bipod, you should be able to pick a model that is perfect for your rifle without need for additional components. 7. Can the bipod be used in the snow? Most of the AR-15 bipods we've reviewed are constructed with Aluminium material. Even those that are made out of other materials either contain coated metals or stainless steel. These materials do not rust; thus moisture shouldn't be a problem. So whether you're hunting in the snow or rain, you have absolutely nothing to worry about. 8. Will this bipod be able to withstand the recoil of my AR-15? As we indicated earlier, stability is one of the most important considerations you should pay attention to when getting a bipod for your rifle. This will ensure you don't correct the position of the bipod every time you take a shot. Unstable bipods can short-live your experience and make you turn in before the day is over. More so, such bipods do not last.